The heat was rising in waves from my body. I was drenched in sweat and my tongue and mouth were dry. My lips were gummed together. My good friend, Dr Vivek Nuguri, was wetting his mouth with sea water which he had collected from a natural pool. It was towards the end of August, one of the hottest months in Aruba, a small Caribbean island lying 27 km off the coast of Venezuela. It is 33 km long and is one of the four constituent parts of the Netherlands. Unlike much of the Caribbean, Aruba has a dry climate and the semiarid landscape is dominated by cacti and the wind-sculpted divi-divi trees (Caesalpinia coriaria). With a population of one hundred thousand residents and eight hundred thousand tourists, most of the island is a civilized expanse of houses, shops, restaurants, hotels, schools, colleges and government offices. I have always been fascinated by the arid Atlantic coast, towards the northern side of the island. This coast is rugged, rocky and dotted with small rolling hills. Aruba is popular among tourists from Europe, Latin America and the Eastern seaboard of the United States, for its coral white beaches, azure waters, world class hotels, high class restaurants and a vibrant night life. The seas on the side facing Venezuela are calm, gentle and civilized, offering great opportunities for snorkeling and water sports. My trekking partners: I am a faculty member at the Xavier University School of Medicine, an offshore medical school on the island, admitting undergraduates mainly from the United States and Canada. Many of them are of South Asian descent and the faculty is largely drawn from that region. 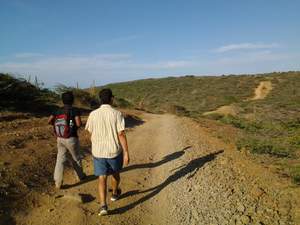 Slowly we have formed a small group of people who like to walk on the small, mostly arid hills in the interior of the island. Among the team members, all of us medics, are Ramanan Balasubramanium from Sri Lanka, who is into fitness and loves to cook and eat incredibly spicy food; Vivek Nuguri, nicknamed ‘Thambi’, which is Tamil for small brother, from Telengana in South India, who spent many years in the United States and loves to talk and walk; Ravi Ramireddy, whom we affectionately call Bhaiya or brother, and who is from Andhra Pradesh and enjoys cooking and handcrafting culinary masterpieces – and is also very much into body building; and Atanu Nandy, originally from West Bengal but now settled in Ontario, who is Bhaiya’s gym partner. Conchi: We had always been fascinated by descriptions of the natural pool, called Conchi in Papiamento, Aruba’s local language. Tourist magazines describe it as a pool on the island’s desolate Atlantic coast, bordered by black slippery rocks and filling naturally with sea water. Many writers are fascinated by the large crabs found on the rocks ringing the pool which, if you are not careful, may nip you in a sensitive area of your anatomy. These days, good travel writing is becoming more difficult to find and you are more likely to come across videos and photos of tourist attractions. Dr Bala, whom we call Ram, had been to Conchi on an all-terrain vehicle, or ATV, with his sister, nephew and niece. His vivid descriptions strengthened our resolve to visit it. Cero Arikok: However, rather than use a gas-guzzling ATV and reach the pool using fossil fuel, we wanted to reach it under human power. We set off around 4 o’clock in the afternoon from the base of Cero Arikok, a hill in the Arikok National Park. The park covers around a fifth of the island’s surface area and includes a chain of small hills, the rocky Atlantic coast and kerchief-sized, pristine sandy beaches where leatherback turtles lie and hatch their eggs. We reached the base of Cero Arikok which, at around 180 m, is the second highest hill on the island, and started climbing. Our attention was riveted by the circular, gleaming structure on top which may most probably be a communication structure. However, the design gave it an other-worldly, futuristic aspect and Dr Nuguri, who is knowledgeable about a variety of topics under the sun and even under the night sky, speculated that it may be a listening station for the Search for Extraterrestrial Intelligence Project. The view from the top of Mt Arikok was spectacular and we could see a large portion of the wild Atlantic coast. Towards the east we could see windmills gracefully rotating under the powerful trade winds which batter the island during most of the year. We could see the various beaches and the waves churning spray as they crashed on the rocky coastline. Aruba’s tallest hill, Mt Jamanota, has a communication tower at the top. We could also see the Frenchmen’s Pass, where the island’s Indians defended the island against the French. Towards the south west, the capital city of Oranjestad sprawled towards the coast and I could recognize the huge crane in the harbour. We could see a number of giant cargo ships in the distance, moving towards Venezuela and Colombia. Hiking to Conchi: The walk to Conchi was long and dusty. Along the way there were a few ATVs and jeeps painted in bright flaming colors, which raced up and down the barren hills raising huge dust clouds behind them. Giant cacti dominated the landscape and the wind threatened to sweep us off our feet. The entrance to the pool area was lined by a caravan of vehicles and the descent was steep but short. Ram, who loves the sea, jumped right in, at home among the frolicking bathers. Bhaiya, who has a scientific bent, looked around curiously. Surrounded by black rocks, the dark blue sea, the churning waves and the barren hills, it seemed like we had stepped back in time. The windmills, more correctly wind turbines, in the far distance, were the only reminder of the twenty-first century. Grand Cherokee: We have visited the wild side of Aruba, which is widely and successfully marketed as ‘one happy island’ on a number of occasions. We usually travel in Dr Nuguri’s Grand Cherokee. I think it fitting that a vehicle named after an Indian tribe should help us explore the mountains and caves once occupied by the Arawak Indians. Vivek, as we call him, is good at directions and route finding and his ‘intelligent’ car provides constant updates about direction and speed. Natural bridge and Daimari: The natural bridge was a huge coral rock formation 100 feet long and 26 feet high and was the largest of its kind in the Caribbean until its collapse in 2005. A baby bridge has now been formed by the pounding waves. The hills around the natural bridge offer good hiking opportunities. Along the coast towards the eastern side is one of the finest beaches on the island, the Boca Daimari. The pristine white sand, the sand dunes covered with green vegetation and the rock rising from the sea are the main attractions. During low tide the water draws away from the rock and a path opens up, enabling you to walk right up to its base. You feel like the Biblical Moses, who parted the waves enabling the Israelites to escape. At the beginning of the walk is the Rancho Daimari. The buildings and stables are surrounded by lush green coconut plantations, which are among the densest and greenest on Aruba. Coming originally from Kerala in South India, a coastal state named after the coconut palm, I have always been fascinated by the tree’s gracefulness. Aruba’s climate being dry and arid, the coconut and other palms are not ubiquitous there. A number of trees have been planted along the avenues in Oranjestad, the capital, and are carefully nurtured through drip irrigation. The plantation at Rancho Daimari is reputed to be one of the oldest on the island, dating back to the seventeenth century, and was started by the earliest Dutch settlers on the island. Arid Aruba: Because of Aruba’s arid climate and scanty rainfall, extensive plantations were not developed on it and the island escaped the slave culture common to many other Caribbean islands. For a long time, and due to a lack of agricultural opportunities, Aruba was scarcely populated and remained poor. The population migrated seasonally for work to Cuba, Venezuela, Jamaica and Colombia. The island started developing economically only after the Second World War, when economic development took off in the United States and the Caribbean rose to prominence as a tourist destination. Aruba guarantees plenty of sun and the white beaches and calm seas were a major attraction. The island is politically stable, the people are welcoming and the variety of cultures makes for a sizzling melting pot. There are strong sea currents on the northern side of the island, which make travel by boat to other islands difficult, and Aruba has traditionally been more closely connected to South America than to other Caribbean islands. Cabrito: From the ranch, the narrow, boulder-strewn path winds around hills and you eventually come to the inviting white sands of Daimari beach. After the beach the path climbs steeply and then descends. On both sides you see grazing wild goats and the area is carpeted by dark goat dung. I have read that goat dung is an excellent fertilizer but, in Aruba, it lies exposed to the harsh sun and the roaring salt-laden winds. The goat is the source of the tasty cabrito, or goat meat. Cabrito stoba, goat meat stew, is one of the island’s favorite dishes. As in Nepal and many other parts of the world, the local people have a preference for goat, which is among the most expensive kinds of meat. My good friend Bhaiya makes spicy goat curry redolent of Andhra Pradesh and guaranteed to fire up your innards! You continue through the boulder-strewn landscape until you reach Conchi. We eventually discovered that the route from Rancho Daimari was a shorter and more direct route to Conchi than the one we had taken. Our colleague Liza Koolman goes horseback riding around the beach and she had described this wonderful place to us. This side of the island is a far cry from the other touristy side, dotted with high-rise and low-rise hotels, restaurants, fast food joints and pizza parlors. The Atlantic side has been left in its natural state with few tourist conveniences and attractions. Tour operators conduct jeep and ATV tours in this region but the number of tourists is still low. I enjoy this ‘wild’ and desolate side of this one happy island where man is at one with nature. Ravi Shankar is a clinical pharmacologist and Professor of Pharmacology at the Xavier University School of Medicine, Aruba. He is a keen trekker, photographer and creative writer. He spent many years in Nepal and has written articles for a number of Nepalese newspapers and magazines, notably the Himalayan Times, ECS Nepal and Vivacity. Ravi’s professional research interests include the rational use of medicines and medical education and he has had well over 500 papers and articles published in various professional journals.